the kettle is on and he's got something he wants you to hear. Brendan O'Shea, from Killarney South West of Ireland, has written and recorded a beautiful bombshell of a record. It's understated in comparison to the power-pop rockers that command the airwaves but confidently delivers radio friendly, real deal songs that wrap around the listener, enticing them to contentedly hum along, shuffle their feet and smile. After leaving Ireland in the late 90's, O'Shea has by now become a veteran of New York's East Village songwriter scene. He's shared stages with The Cowboy Junkies, 10,000 Maniacs, Elliott Smith, Interpol, as well as with many Irish indie superstars on both sides of the Atlantic. With or without a guitar in hand, O'Shea excels at drawing people in, using a palate of warm colorful moods and phrases. Whether on his newest release, "Be Here Still", his follow-up to the well received 2003 debut, "In the Light", or on stage in a club on the Lower East Side of Manhattan, he is the consummate host and creates no less than a menu of chorus laden delights. 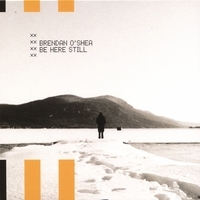 With it's supremely uncluttered production, courtesy of Ed Tinley, Karl Odlum, and Ike Reilly, "Be Here Still", recorded in Chicage, NYC, and Dublin is up there with David Gray's "A Century Ends", with its grounded stories of ordinary peoples' lives. It evokes images of candelit conversations with friends and lovers past and present. It's melodic, warm, and imbued with quietly rousing arms in the air of immediacy, thanks to a tight, yet dynamic rhythm section, and strings by Julia Kent and Rob Moose of Antony and the Johnsons. The opening track "Tired Eyes" is a sauntering tale that plants Irish immigrants in the hustle of NY yet firmly represents, not the lost, but the young, savvy, cosmopolitan Irish and their integration and advancing in the New World. Throughout this record, there appear touches of this new american home, with faint nods to southern roots songs, which seamlessly attach to hints of O'Shea's past musical affilliations. You'll see the shadows of Irish rockstars of late, Irish traditional melodies and the poetic flair of the countryside, as on the track, "Still", but it's not soaked with sentimentality and none of it ever wielded so much, as to hide the man himself. Picture an Irishman, in New York, standing with arms open wide....telling you the kettle is on and he's got something he wants you to hear. Great ballads, again a wonderful CD, and hopefully not the last! Not quite as intimate and sweet sounding as the first cd but well worth a listen. Either live or on CD Brendan has never failed to deliver the goods. This latest offering is first class, not a weak track to be found on the CD. Thanks Brendan, keep'em comin'!